Word was out about this new puzzle game for the DS that had RPG elements. At first it didn't sound to interesting to me. I had thought to myself, "An RPG game that you battle with puzzles?! That sounds stupid." Yet the more I heard about it, the more intrigued I became. Finally I heard some more details about the game on the DS board, and I knew I had to have it! My quest began, but was short lived as I went from store to store and to no avail. I couldn't find the game anywhere! I was about to give up in the final store when someone came to my aid. At last, the game I longed for was in my grasp, and soon to be in my precious DS. I bet you've never heard of a puzzle game that had a storyline, have you? Well look no further because now we have one! The adventure begins as you are training to be part of the royal knights for the Queen. You enter your first few battles not expecting much, but boy do things fly by. Before you know it, the Queen asks for help in delivering a letter to your father. He is quite happy to see you and even gives you a gift left behind by your late grandfather. Though the happy reunion doesn't last long. Things are heating up as undead creatures are over powering the city, and everyone thought your grandfather was going crazy before he died. Boy, were they wrong! Soon you find yourself traveling all over to recruit help to free the land from evil Warlords that have been controlling what's going on. Wrenched scum is what I would call them. Many times some try to persuade you to turn the other way or even worse, join forces with them. Whatever your choice maybe, the battle is going to be a long one. For me, I always did what was right. At times the story seemed to be a bit dry to me. It kind of felt like a stage play gone bad. So this is not the highlight of the game by any means. As you start the game you will have four different classes to choose from along with four different characters. The characters themselves don't differ in anyway except for looks. The classes, however, do hold differences. Druid are well schooled in the magic of nature with many spells based on Yellow and Green Mana. They defeat their foes in a subtle manner, often doing such things as entangling them or changing the gems on the board. Knights are noble and chivalrous warriors who excel in using the Stars on the board to great effect, such as gaining extra XP or healing themselves. They also have a good stock of damage spells based on Red and Green Mana. Warriors are fierce and efficient fighters whose special attacks mostly deal direct damage to their foes. Although many of these damage spells are based on Red Mana, they have a wide variety of them for use in different situations. Wizards keep a good mix of different spells, based largely on Red and Yellow Mana. They can just as easily cast damage spells like Fireballs, as they can cast powerful defensive spells like Wall of Fire. Classes aren't all that make up the strategy of this game. As you know this is a puzzle game. 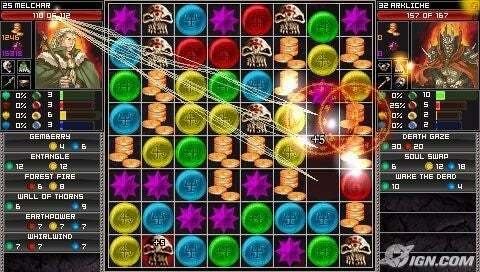 With a battle style based off of Bejeweled, which is a classic game of gems on a board that you can swap two adjacent ones to form a line of 3 or more matching colors, the action begins. There is a twist in this version though; these colors represent Mana. Just like every classic RPG we have the four main elements of: Earth, Fire, Air, and Water. As you match these gems up, you will gain the Mana to use in casting spells in battle. You can see on this battle grid the different gems that are used. Also the profiles on either side of the battle grid are what is displayed on the top screen. Along with the Mana gems are coins, skulls and purple stars. Coins of course are for money, skulls for damaging your opponent and the stars are to gain extra experience points. Even if you loose the battle, you will still keep the coin and EXP that you earned in the match. If you win the battle that amount increases. This amount can also vary based on the skills you have. Within the games storyline, there are many side quests. This is something I truly enjoyed because it took you to more places and gave your advantages when it came to forging weapons. 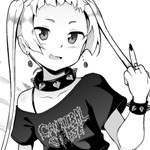 As you progress in the game, people will ask for your assistance with various tasks. You can gain additional coin and EXP by completing these quests. On top of that, you will also be able to take control of the map. When you build up enough money, you will start to develop your city. There are many aspects to running your land. You will need a Dungeon, Mage Tower, Stable, Forge shop, Siege Workshop, Temple, and Towers. Each of these adds to the abilities you will have in the game. All of this is developed through the Citadel opinion when you are in a city you control. Taking over a city is much like any other battle in the game. You go up against the city, which normally has more life points then other opponents. Once they have fallen to your power, they will have to pay you a monthly tribute. You collect this by simply waking to the town. Anyone that knows me, knows I LOVE money it games. I found myself just wondering the map gaining loads of cash. Power house Rhyme, taking all the gold from the poor. This is what the map looks like. You don't roam around freely; instead you just select your destination and your player with travel there. Once over the captured town you will see money added to you if the tribute is due. You can also see that you will be buying a forge shop and a stable. If you have battled a foe 3 times or more, you will gain the opinion to capture them. Capturing is done a bit differently then a normal battle; instead of doing the face off, you will be given a puzzle with a set amount of pieces. Your objective is to clear the board of all gems. Not to worry though, you can do this as many times as you need to. Once captured you can learn the skills of the enemy by doing spell research. This requires yet another puzzle in which you have to get the set amount of each gem. Forging items requires you to capture ruins. These are basically caves scattered through out the land. Each ruin has a guardian. Guardians are foes who tend to be a bit harder then the average battle in the game. Often times they have addition spells or attack power. I'd have to say these are the most annoying out of any opponent you'll face in this game. As you can see, there is a LOT to the game play. I haven't even described everything this game has to offer. Sadly because of the lack of wifi for most of the copies of this game, even this can get old. Yes there is so much involved, but I didn't really get into the game until I got the xbox arcade version of it. Playing online with friends was just so amazing. Especially since there are handicaps for those that might be of a high level. This game isn't about the graphics at all! It's all about the strategy and game play, yet they didn't hold back. The characters are all very much detailed. Bounteous in beauty would be the world map, which shows the mountainous regions and the rivers. Everything is well laid out. Here your character is coming across another person in the game. 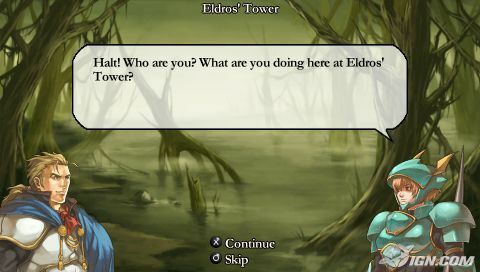 Above is how the conversation looks when in towns or other places in the game. Normally it's just a dialog between two individuals on a set background. There is no real animation going on and nothing to exciting. Yet there are details that can be seen in each background, which is a nice touch. Overall, it's nothing to write home about. I basically felt like I was playing a simple game with more involvement on my part. Kind of like a Dungeon and Dragons sort of thing, but with visuals. Here is where the game takes a plunge. Music is lacking big time and although it can be quite dramatic at times, it is far to repetitive. Especially the victory song, which in all cases it plays right into the next match. I found this to be very annoying. With the lack of sound effects, you can tell this game fell short on design. You do get the bangs in during battle, but nothing to get excited over. If they played it up more, this could have been a very enticing sound track. However, it's not one you would want to hear more then you have to. In fact, just turn the sound off and play your own music. You can battle your hero against a friend's hero in Multiplayer using the DS's wireless capabilities. In order to do this, one player needs to create a game while the other player should join in. Each player requires his or her own Game Card to play, so there is no download for this game. 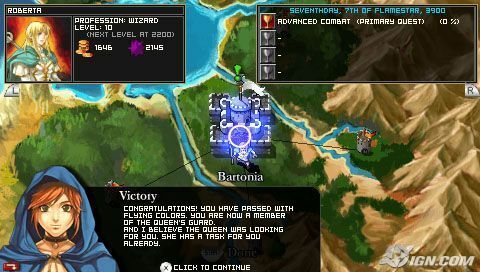 The rules for multiplayer battle are identical to those of a regular battle with the winner being determined by which hero reduces their opponent's life points to zero first. As mentioned earlier, this is another disappointment to the game because it requires to be in the same room with your opponent. Therefore, there is no over the internet wifi play in this game. When I first played this game on the DS, I was so addicted to it. I have to say I've found the same love for the game with the xbox arcade version. Not only do you have everything mentioned in this review, but you get an additional 4 classes with an add-on that you can buy. This also includes more quests, weapons, items, and enemies. I will say you have to be a lover of puzzle and strategy to get anything out of this game. Most people I've talked to have gotten board fast. However my online buddy and I just love this game and are looking forward to the next installment, which is coming out this year! For me after reevaluating this game, I would give it a 7/10. When I first reviewed this, it was 8/10 but I was mostly blinded by personal love. It's not a game for everyone, while there are many pros to the game, it falls short on so many things. It seems to be a cross between the old war board games and magic the gathering card game. Wifi did make this game a lot better, but I still have taken the score down by a whole point because of all the things it does lack. For me personally it's a 9/10, but for those that aren't really into this style of games it's just above average for a puzzle game. I'm finding it hard to believe this is a new review on your end, based on the style. Would I be correct in assuming this was reviewed at Oldsider? Anyways, I've never heard of the game. In some regard, I see parallels between it and the new "Henry Hatsworth" game. Some, not many, but key elements like the story being a part of the puzzle. It was on oldsider and won me community post of the week on the home page of nintendo.com. However, this is a revised version and I remade it because of the new game coming out this year. The new one is set to the future with space ships and such. The battle system is going to be a bit different in the new one as well. More of a challenge actually. I just hope they have it wifi this time. Because if not I'll probably just wait for the 360 arcade version to come out rather then getting the handheld versions. Oh good, as things like breaking into sections seemed really, really novice - especially for someone of your caliber in terms of reviews. I'll do a full critique, if you like, but that threw me for a loop. Well if you like puzzle games it's worth checking out. But I would wait for the new one because it's a lot better when you play wifi with a friend. I quite enjoy puzzle titles, so it may very well be worth a rental, at least. Of course, the aforementioned Henry Hatsworth is my priority in terms of puzzlers.